I find it in turns amusing and frustrating when someone pleads in extended natural-language sentences to their out-of-control dog, by all appearances with the intention of getting the dog to listen, understand, and adapt its behavior accordingly. I say these owners have that intention “by all appearances” because it is very difficult for me to understand what these people are thinking. 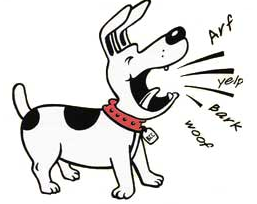 Dogs don’t speak English; the ones that have been trained to understand a few commands here or there understand just that – commands – not full English sentences. And even if some superdogs have been trained to understand full sentences, these waffly, wishy-washy streams of consciousness aren’t the kinds of sentences the trainers of those superdogs have worked on. And anyway, these dogs don’t understand those sentences, and their owners must certainly know that! I have a new theory, though: the people who ramble on like this aren’t actually speaking to their dogs; they’re speaking to everyone around them. They have no control over their dogs, no idea what to do to to stop them from acting up or to get them to behave; but instead of admitting it upfront – or, god forbid, actually trying and working on different methods that might in fact help – they want it to at least seem to everyone around (and probably to themselves as well) that they are fully trying, doing everything anyone could possibly hope for. Hudson just won’t listen – it isn’t the owner’s fault, since he’s talking up a storm and Hudson still won’t listen! Evidence presented, case closed; it’s the dog’s fault. Now you can all go back to sipping your drinks and instead of blaming the owner, have pity. In fact, buy him a drink, he needs it after putting up with this four-legged terror! Of course this is ridiculous: whether or not a particular dog understands verbal commands, he can still be influenced to be calm-submissive and happily obedient. Dogs that don’t know commands need to be communicated with in non-verbal, sensual, physical and energetic ways: low, calming tones; body-blocking, physical touch; tap on the leash; leading the dog away from the problem area; redirecting to desired behavior; and finally, rewarding the desired, replacement behaviors with treats, praise, pets, and other positive reinforcement like play, relaxation, and socialization. Hudson obviously isn’t trained to listen to the drivel his owner is muttering; but that doesn’t mean the owner can’t start right now, right where Hudson is, cut the unbalanced behavior off at the source and reinforce the calm, obedient behavior that would appear in its place. And starting there, of course he can then progress to teaching Hudson some simple commands like “Come”, “Lie down”, or “Calm”. wow. What a timely article. We had friends over last weekend. They brought their calm, sweet natured 7 year old Labrador, Indie. Indie has been here a few times and our dog, 12 year old Papillon Megan, has barked but usually quiets down after 5 minutes. This visit Megan barked for 4 hours! I picked up and presented rear end to Indie (calm quiet) then reversed (also quiet). Once back on the ground Megan continued barking. She ignored commands, evaded me and was a pest. Indie, to her credit, remained calm and quiet the entire time. We put Megan in the bedroom and usually she calms down then quiets but not this time. It was annoying and embarrassing. She only stopped when the guest picked her up while I was in the kitchen getting dinner. I don’t pick her up and coo during a barking session. Megan was surrendered two years ago by an 80 year lady with Alzheimer’s. Her medical/dental care, diet and appearance have been top notch her entire life. I know the breeder she came from and both hubby and I have had numerous dogs. We fostered a short-haired St Bernard and socialized him before finding that forever home. This 4.5 lb little critter stumps me. Any suggestions? Dogs should always be introduced outdoors in neutral territory. Then pack-walked together, and if possible taken together to the dog park to bond. Also you should be able to cut off your dog’s barking with corrective communications, and work incompatible alternative obedience rituals like go to your bed.